The relationship between mental health services and tobacco is a long – and not necessarily happy – one. Tobacco was a big part of daily life in the institutions that are now confined to history in the UK. It was used as a form of reward in token economy schemes and as wages in the distant past for those individuals deemed fit enough to be ward ‘workers’. Until relatively recently, the characteristic smell of mental health wards was of stale tobacco. Even worse were the day rooms, with an atmosphere almost akin to the smog of post-war London. The rate of smoking among people with severe mental illness is still twice that of people without such a diagnosis or label. Endeavours to prohibit smoking in healthcare settings have been fraught with challenges. At the heart of the debate is the libertarian argument that it is wrong to impose such a restriction on a person already deprived of their civil liberties. There is no doubt that sterling work has been undertaken to support people who find themselves in a smoke-free setting but who are addicted to smoking. But as nurses we have to ask if it’s a good use of scarce staff time to provide escorts to smoking areas for service users. At a level of principle, we should also ask whether it is right to facilitate a harmful habit while purporting to be in the business of health. Vaping is promoted as a safer way of delivery nicotine, with many of the harmful toxins removed. 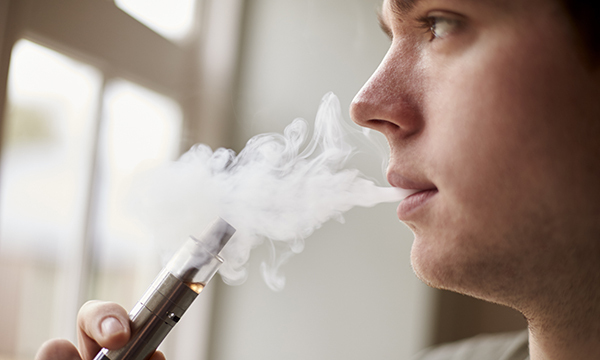 A new report by the House of Commons science and technology committee says it is unacceptable that one third of mental health trusts still ban vaping on their premises. The MPs point out that while uncertainty remains about the long-term health effects of e-cigarettes, they can accelerate a decline in smoking. So can this new technology help people in mental healthcare settings give up tobacco? And can it be introduced to clinical areas without returning us to the smoke-filled rooms of the past? Perhaps the bigger question is whether we should introduce a drug delivery technology to a health setting without a clear understanding of its long-term effects. I wonder if a similar lack of rigour would be acceptable in relation to other health technologies. And if not, why should people with mental health issues be expected to accept a lower standard of proof?